Detailed species accounts with photos, illustrations, calls, and range maps for 32 species. A description of frogs and toads found in Tennessee. Extractions: Rana catesbeiana Info: Bullfrogs are the largest frogs in the U.S. - typically 3.5 - 6 inches long. They are green to brown in color and are characterized by a ridge curving from behind the eye around the tympanum (the "ears"). Metamorphosis of tadpoles takes 1 to 2 years. They will eat almost anything they can fit into their mouths. Voice: ( WAV or AU file ) Described as a deep, bass "VRUU-UUM". (courtesy of Lang Elliot) Habitat: Bullfrogs live in medium to large permanent bodies of water (lakes or ponds) throughout Tennessee. Green Frog Rana clamitans Info: Green Frogs range in size between 2 and 3.5 inches long. They are green to brown in color, and are characterized by ridges around the tympanum and folds extending down the middle of the back. Metamorphosis of tadpoles takes several months. Voice: ( WAV or AU file ) Similar to the sound of a loose banjo string. Extractions: Photos by Author Missouri toads and frogs are colorful, harmless, vocal and valuable. Our forests, prairies, rivers, swamps and marshes are home to a multitude of toads and frogs, but few people know how many varieties we have, how to tell them apart, or much about their natural history. Studying these animals and sharing their stories with fellow Missourians is one of the most pleasurable and rewarding aspects of my work. An egg mass from the wood frog Some tadpoles are beautifully colored (eastern gray treefrog). One often-asked question is: "What are the differences between toads and frogs?" While they are more similar than different, there are some basic distinctions. Toads have dry, warty skin, while frogs have smooth, wet kin. Toads do not have teeth; frogs have tiny teeth on both upper and lower jaws. Toads have shorter hind legs than most frogs. Toads hop, frogs jump. Female toads lay their eggs in long, parallel strings; female frogs-depending on the species-lay their eggs singly, in small clumps, in large clumps, or as a film of eggs on the water surface. 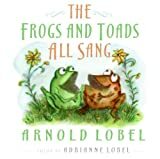 Although most people would be hard-pressed to identify a variety of toads and frogs by the sounds they make, people generally are aware of the fact that these animals have voices and are interesting to listen to. A male toad or frog produces his call by a rapid back-and-forth movement of air over his vocal cords. When calling, a toad or frog will close its mouth and nasal openings and force air from its lungs over the vocal cords into the mouth cavity, then back over the vocal cords and into the lungs. Producing a sound in this "closed system" enables some anurans (toads and frogs) to vocalize under water. These animals use an enlarged throat or expandable vocal sac to resonate their calls. frogs AND toads. PART OF KIDS ARK. Have you any reports about frogs and toads? If so send them to us and we could feature them in the site. GREEN FROG SURVEY. An introduction to the natural history of the frogs and toads of the state. Extractions: Table of Contents Gray treefrogs Hyla chrysoscelis and ... Rana catesbeiana There are five species of true frogs found in Ohio. The true frogs or ranids generally have a dorsolateral fold of glandular tissue extending from in back of the ear drum or tympanum nearly to the hind legs. Bullfrogs are the exception and do not possess a dorsolateral fold. Ranidae is the largest family of frogs; its members typically have prominent lobes on the rear margin of the tongue, long legs, and extensive webbing between the toes. 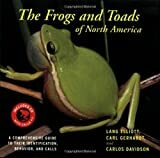 frogs and toads in Color and Sound by Lang Elliott, NatureSound Studio. Click here for a complete list of frog and toad species included in my photocollection. Care and feeding for a variety of subspecies, including tree frogs, dwarf frogs, firebellied toads, and ornate horned frogs. Extractions: Denise's FrOgGy PaGe Hey everyone. Yesturday for valentines day my friend Mike bought me a Tomato froggie. She is super cute. I named her Lub-Nub (it is an ewok word) She is pretty fat but she will most likely get larger. I have many pets and have many species of FrOgS. At the moment I house a Asian Painted Frog and a picture of a frog like him is below. I named him "The Big Fat Cute Frog" because thats what me and my friend Mike would always call him when we saw him in the store. Oriental Firebellied Toad named "Sprocket" , and a male Green Tree Frog named "Chubbies". I had two other green tree frogs a female named Meechi and a female Green Tree Frog named "Chewie" but she died due to dye leaking from her terrarium wood when it got wet. (I took the wood back to the pet store and told them that it was unsafe for animals and i got a refund but they are still selling the wood.) I also had two African Dwarf Frogs named "GoRf" and "Zen" who also passed on for unknown reasons. If your stopping by for the first time feel free to sign my Guestbook or e-mail me because I always love to hear from people.. -Denise click on the cute little frog to see a picture of my new frog. Pictures of Gin's pet frogs and stories. Some Strange but True Facts about frogs And toads!!! Click here to take the tour. General What is a Frog? Frog or Toad? Images, sounds, and species descriptions of frogs and toads from site in South Carolina. Extractions: in that family. Scientific Name Common Name Pelobatidae Spadefoot toads Bufonidae True toads ... True frogs The Savannah River Site, rich in wetlands, provides habitat for many species of anurans, the frogs and toads. Anurans all look similar: They are tail-less as adults, but they exhibit a variety of modifications that suit them for their different ways of life. True frogs have powerful hind legs with extensive webbing on their back feet for swimming. Treefrogs have sticky disks on their toes for climbing, and toads have a drier skin for a more terrestrial existence. Like their relatives, the salamanders, most frogs and toads exhibit a complex life cycle, beginning as an egg, hatching into an aquatic larva (a tadpole, which does have a tail), undergoing metamorphosis, and eventually leaving the water in the adult form. This process takes longer in some species than in others. Spadefoot toads, for example, often breed in temporary pools, so their development time must be brief to avoid drying. They metamorphose in just a few weeks. The more aquatic bullfrog drops her eggs in permanent waters, and the tadpoles may take as long as two years to complete development. Some of these animals are commonly encountered, but others are secretive, spending most of their time underground, in the water, or high in trees. The best time to observe the more inconspicuous frogs and toads is during breeding season. On warm spring and summer nights the wetlands of the SRS are humming with frog songs, as males call out to attract potential mates. Frogs and toads can be identified by their calls, which are unique to their species. Make sure to check out the calls here on our Web site. Sketches and descriptions of the most common types. Extractions: Since 1989, an increasing number of scientists have been studying the decline of frog and toad populations around the world. These declines have been associated with habitat loss and fragmentation, chemical pollution, ultraviolet radiation, acid precipitation, commercial harvest for food, and unknown causes. Understanding frogs may help us better understand how these problems affect humans, too. Learning about frogs is also fun and, as this page shows, opens a door to a facinating corner of the natural world. Click here for color images and the calls of these frogs and toads) *Descriptions adapted by Cindy Reinitz from J. Gerholdt, This is a familiar species, often called a "grass frog." It is found in all Minnesota counties. This large frog averages from 2 to 3 1/2 inches (5-9 cm.) in length, through the record is 4 3/8 inches. The basic color is green or brown and there are usually two or three rows of dark spots on the back, some large and some small. The Northern Leopard also may have no spots at all or, less commonly, extra dark markings between the rows of spots. It lives in a wide variety of habitats, but is usually found in meadows and open fields near bodies of water. EnchantedLearning.com frogs and toads, Frog and Toad K3 Theme Page. Diet frogs and toads eat insects, spiders, small fish, worms and other tiny animals. Find out about frogs, toads and tadpoles, newts and pond bugs, how to pond dip, and how to make a wildlife pond. Send in pictures and reports of pond animals you have seen.